We talked yesterday about how to get your business listed locally in search engines, but we really didn’t say a lot about why you should want to. Claiming your business on the search engines allows you to rank higher for local searches (e.g. dentist in little rock arkansas). It also puts you on the map (if you are a new business and the search engines don’t yet know about you) and higher on the map (if you follow our tips from yesterday). Ever notice those maps that show up in the search results when you search for something local? You know, the ones with A, B, C… location pins, then the list with corresponding businesses. Well, you can move higher up the ladder by claiming your Google Place (and Bing and Yahoo) and following the tips we suggested yesterday. Sometimes when you click on a business’s “place page” in Google, for instance, you’ll see that it hasn’t yet been owner verified. That means the owner of that business has not claimed it on Google. But you may ask, “how can this business be listed when the owner hasn’t claimed it and they don’t even have a website?” Well, that’s because Google and the other search engines use multiple sources (e.g. yellow pages) to come up with this information. And this is one of the main reasons you want to claim your business on the search engines- you don’t want your competition showing up higher on the map than you, especially when they haven’t even claimed their business. 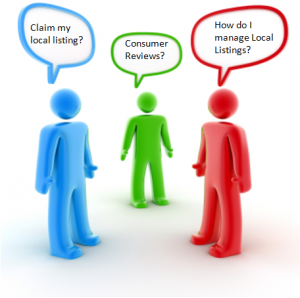 So claim your business today using the local listing tips we gave you in yesterday’s post, and start showing up higher in those local search results.